At the Huntington Convention Center on the banks of beautiful Lake Erie, professionals from across the country gathered for the United States Army Reserve Energy and Water Manager Training Workshop. The Army Reserve Installation Management Directorate (ARIMD) presented the workshop in conjunction with the United States Department of Energy’s 2018 Energy Exchange in Cleveland, Ohio in late August. Paul Wirt, Chief of the Facility Policy Division of ARIMD, opened the workshop with remarks about the Army Reserve’s contributions to Army-wide energy and water resilience. He honored the Army Reserve’s newly minted Certified Energy Managers, as well as two award winners. Greg Vallery, Director of Public Works at Fort Hunter Liggett, received the Secretary of the Army Energy and Water Management Award for Individual Exceptional Performance. Rickey Johns, Energy Manager at the 63rd Readiness Division, received a special commendation from Robert Maxwell, Army Reserve Chief Financial Officer and Director of Resource Management and Materiel, for his dedicated service to the energy program. Judith Hudson, Chief of the Facility Policy Division at the Office of the Assistant Chief of Staff for Installation Management, then addressed the attendees. She inspired them to view their energy and water initiatives through a “lens of resilience.” “Ask yourself: what are your critical missions, and how can you support them through the activities that you are doing in energy and water?” she said. She alluded to the Army’s need to be ready in the face of natural disasters. “When the hurricane hits, how you are going to enable your Soldiers to complete their missions?” she asked, stressing the importance of assured access to energy. Hudson also urged the teams to “challenge assumptions,” so they are constantly aware of potential impediments to energy and water security and solutions to those concerns. In the following briefings, several energy and water professionals from ARIMD and Pacific Northwest National Laboratory discussed topics such as the Energy Resilience and Conservation Investment Program; Energy Savings Performance Contracts; the Enterprise Building Control System; and the Resource Efficiency Manager Program. Anibal Negron, Energy Manager at Fort Buchanan, offered a presentation on the state of his Installation’s energy and water projects in the wake of Hurricane Maria, which devastated the Caribbean island in the fall of 2017. Representatives from Installations and Readiness Divisions also participated in breakout groups, where they discussed their visions for a resilient Army Reserve. The United States Department of Energy has lauded the United States Army Reserve’s 88th Readiness Division with two Interior Lighting Campaign awards. The Interior Lighting Campaign is a recognition and guidance program that encourages participants to improve lighting systems – specifically troffer, high bay, low bay and suspended linear lighting systems and controls – in their efforts to conserve energy and bolster the energy efficiency of their facilities. As of February 2018, Interior Lighting Campaign participants have planned or completed improvements to 1.6 million lighting systems estimated to save $28 million in electricity costs and 227 million kilowatt hours of power annually. The Army Reserve’s four Readiness Divisions and Mission Support Command are among nearly 70 participants in the Interior Lighting Campaign, which also includes cities, universities, retail companies and health care providers. The 88th Readiness Division was one of 13 participating agencies to receive Interior Lighting Campaign honors during this year’s award cycle. The Colonel P. Schulstad Army Reserve Center in Arlington Heights, Illinois received an award for Highest Percentage of Annual Energy Savings for Troffer Lighting Retrofits in a Large Project. Energy efficient light emitting diodes, or LEDs, replaced T-8 fluorescent lamps in 1,225 troffers in the facility. The improvements reduced energy use by 231,000 kilowatt hours, or 72 percent, for an estimated annual cost avoidance of $16,200. The First Lieutenant Robert L. Poxon Army Reserve Center in Southfield, Michigan received an award for Highest Percentage of Annual Energy Savings for Troffer Lighting Retrofits in a Medium Project. There, LEDs replaced fluorescent lamps in 94 troffers. The improvements reduced energy use by 15,000 kilowatt hours, or 63 percent, for an estimated annual cost avoidance of $1,800. Contractors also installed occupancy sensors throughout both facilities. The 88th Readiness Division estimates that the sensors contribute nearly 25 percent of the energy use reductions in the Army Reserve Centers. “We predict that [these projects] will have significant impacts on our annual energy use intensity,” said Chris Jackson, Energy Manager at the 88th Readiness Division. As a Command, the Army Reserve reduced its energy use intensity by 17.7 percent in fiscal year 2017, compared to the fiscal year 2015 baseline. Improvements to the lighting systems at these and other Army Reserve Centers will offer additional benefits to the 88th Readiness Division as well. LEDs have longer lives than fluorescent lamps, so they will be replaced less frequently. Thus, they will reduce maintenance demands at the facilities, and they will lessen disruptions to the structures and their occupants. They will also generate less waste. Overall, the projects will support the holistic integration of sustainability into the “battle rhythm” of the enterprise. Energy is vital to every mission in the Army Reserve. With its efforts to improve the efficiency of its Army Reserve Centers, the 88th Readiness Division is contributing to the Command’s energy conservation goals and protecting the critical resources that ensure our readiness. The Army Reserve Installation Management Directorate supported nominations for the Secretary of the Army Environmental Awards from the 63rd and 88th Readiness Divisions. The 88th Readiness Division submitted a nomination in the category of Environmental Quality, Individual or Team. The nomination described how the 88th Readiness Division’s Environmental Training Team mitigates environmental risk by providing preventative training and unit-level interaction across over 300 Army Reserve facilities in 19 states. The Team focuses to ensure environmental compliance at every facility, promote overall environmental awareness and provide emphasis on critical focus areas of the command. The 63rd Readiness Division submitted a nomination in the category of Environmental Quality, Non-Industrial Installation. The nomination highlighted the robust environmental program at the 63rd Readiness Division and its dedicated, skilled and experienced professionals, who engage in a spectrum of practices that support sustainable operations. The Division also submitted an award nomination for Natural Resources Conservation, Individual or Team. The nomination showcased impressive accomplishments from the Natural Resources Team that have contributed to the continued protection of endangered species. Most notably, efforts led to the conservation of rare plants, including the federally listed, endangered Monterey Spineflower and the state listed, rare Sandmat Manzanita and Wedgeleaf Horkelia. Winners of the Secretary of the Army Environmental Awards will compete at the Secretary of Defense level in early 2018. The recycling bins at two 88th Regional Support Command Facilities in Washington are literally overflowing. But, these increased recycling efforts are pushing the Army Reserve closer to its waste diversion goals. The 88th Readiness Division has experienced significant increases in recycling at two of its facilities in Washington: Pier 23 and Victor L. Kandle Army Reserve Center, both in Tacoma. The increase has required a change in the volume of the recycling services provided by the hauler. Pier 23 has increased the frequency of its recycling service from bi-weekly to weekly. The Area Maintenance Support Activity shop and Units Supply have been the keys to the increase in recycling at Pier 23. They have been diligent in ensuring that all material that can go into the single stream recycling service is placed in the proper containers. In addition, the custodial contractor has worked with the facility to properly dispose of the recycled materials in the facilities. Victor L. Kandle Army Reserve Center has increased the size of its hauler-provided container, from a 60 gallon rolling tote to a two yard recycling dumpster. The Facility Coordinator and the custodial contractor have been working together to increase the recycling in the facility. Both of these sites will soon receive additional indoor recycling bins to support the recycling activities through the efforts of the 88th Readiness Division and the Army Reserve Installation Management Directorate to secure Unfinanced Requirement funds. The staffs are looking forward to observing additional increases in recycling as more indoor infrastructure is installed in these facilities. The U.S. Army Reserve is experiencing an invasion from a little, green alien species. No, they are not aliens from outer space and not escapees from Area 51. These aliens are terrorists that seek and destroy nature and, in this case, trees. Specifically, they target one entire genus or type of tree – the ash tree. Originally from Asia, they are Agrilus planipennis, commonly known as Emerald Ash Borers. Why care? Emerald Ash Borers are small, metallic green beetles that kill every variety of ash tree by boring under the tree bark and disrupting the flow of water and nutrients. Most likely, they came to the United States from Asia on wooden crates from cargo ships or planes. The first United States identification of the Emerald Ash Borer was in southeastern Michigan in 2002. They have been advancing across the United States ever since, and their presence has been confirmed in 27 states: Arkansas, Colorado, Connecticut, Georgia, Illinois, Indiana, Iowa, Kansas, Kentucky, Louisiana, Maryland, Massachusetts, Michigan, Minnesota, Missouri, Nebraska, New Hampshire, New Jersey, New York, North Carolina, Ohio, Pennsylvania, Tennessee, Texas, Virginia, West Virginia and Wisconsin. The insects are already responsible for the destruction of millions of ash trees in these states. Fort Snelling Army Reserve Center in Minnesota recently experienced the wrath of the Emerald Ash Borers when they killed all 19 ash trees at the facility. Other 88th Regional Support Command facilities have experienced significant losses, too. At Joliet Training Area south of Chicago, Illinois, about 7,500 trees have been killed by Emerald Ash Borers. The loss of so many trees could have both environmental and financial impacts. Ecological services such as erosion prevention, water filtration and temperature regulation could decline. Sources of food, fuel and a myriad of consumer goods could diminish, and habitat for wildlife could disappear. Furthermore, the real estate values of infested sites could drop while pest management costs could rise, since annual treatment costs for every affected tree can easily exceed $100 every year. So, the implications of the Emerald Ash Borer’s destructive presence are dire. What can be done to stop these nuisances? Currently, there is no known practical remedy to halt their progress, and no North American ash species has proven to be immune. Biological treatments are now under investigation, and field trials have started. Use locally sourced firewood, and burn it in the same county in which it was purchased. Firewood is a significant transportation mechanism for the Emerald Ash Borer. Don’t move firewood. Beetle larvae can survive if they are hidden in the bark of firewood. Remember: buy local, burn local. Inspect your trees. If you see any sign or symptom of an infestation, contact your State agriculture agency. Chemically treat only high-value ash trees located within 15 miles of a known infestation. Declining trees should be considered for removal. Know State and Federal regulations. Make sure that you understand regulations that govern your state and those you may visit. Report suspected Emerald Ash Borer infestations to your state Department of Agriculture. Talk to friends, neighbors and colleagues about the Emerald Ash Borer and educate them about what they should be aware of on their trees. Ask questions. If you receive ash nursery stock or firewood, know its point of origin and your supplier, as Emerald Ash Borer larvae could be hiding under the bark. Know the quarantines in your area. Bats are critical to our nation’s ecology and economy. They consume tons of insects every night and pollinate numerous food plants, thus providing a natural benefit to farmers, foresters and consumers. In fact, some research indicates that bats provide at least $3 billion in economic value annually. 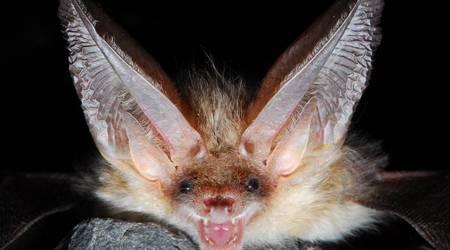 However, a deadly disease is decimating populations of the northern long-eared Bat (NLEB) in the United States and prompting the U.S. Fish and Wildlife Service (USFWS) to protect these important creatures. As a federal entity, the Army Reserve is also tasked with their conservation – a responsibility that the 88th Regional Support Command is heeding to protect military operations as well as our flying friends. The NLEB is found in several Army Reserve regions, primarily in the 88th and 99th RSCs and in a more limited range in the 81st and 63rd RSCs. It is also one of the seven bat species impacted by white-nose syndrome, a fungal disease that has caused the deaths of millions of bats in the northeast. Some affected bat populations have experienced a 99 percent mortality rate. Due to significant population declines caused by the spread of white-nose syndrome throughout the United States and Canada, the USFWS announced that it is protecting the NLEB as a threatened species under the Endangered Species Act (ESA) of 1973. The presence of threatened and endangered species on military installations can have potentially major impacts on the environment and the mission. Species losses can cause devastating ecological imbalances, and “significant use restrictions could be applied by the USFWS and enforced under the ESA if the 88th RSC is not compliant with federal laws” surrounding these species, explained Marshal Braman, an environmental protection specialist and Versar contractor with the 88th RSC. Fortunately, white-nose syndrome has not yet been detected throughout the entire range of the NLEB. And, bats and Soldiers have been living in harmony thus far. “Most training activities are on different time schedules from the bats, so there is minimal potential interaction,” Braman commented. Bats are most active at dawn and dusk and during the night, but nearly all training normally occurs during the day. In the event that a NLEB roost tree is encountered on the training area, Soldiers are to identify its location, immediately cease all activities within a 150 foot radius of the tree and report their observations to natural resources personnel, who will then provide direction regarding continued activities, use of the immediate area and subsequent actions. “The 88th RSC will follow the established measures outlined in the ESMC to avoid potential impacts to the bats and maintain suitable habitat for their continued use,” Braman said. The Army is considered a leader in the efforts to protect our natural world and the rare plants, insects and animals with whom we share our military installations. The programmatic approach between the USFWS and the 88th RSC to protect a once common bat can serve as a model for future actions, and it will ensure the protection of wide-range species and the conservation of the lands and resources that directly support the men and women who defend our freedom.